Chrysler's Street and Racing Technology performance engineering team builds upon the all-new 2011 Chrysler 300 sedan with the 2012 Chrysler 300 SRT8. The new four-door adds an extra slab of power with an upgraded engine rated at an estimated 465 horsepower and 465 lb.-ft. of torque. It also, in white, looks like an angry refrigerator. Under the hood of the new Maytag from Chrysler, the new 6.4-liter Hemi V8 makes its debut in the Chrysler brand product lineup delivering an estimated 465 horsepower and 465 lb.-ft. of torque, up 40 horsepower and 45 lb.-ft. over the 6.1-liter Hemi V8 it replaces. The improved torque output — including an additional 80 lb.-ft. at 2,900 rpm — allows for what Chrysler calls "inspired standing starts," while new, performance-tuned motor mounts improve idle stability and ride control. An active intake manifold and high-lift camshaft with cam phasing provides maximum low-end torque while optimizing high-end power. That helps to set projected performance numbers at 0-to-60 mph acceleration in the high four-second range; quarter mile in high 12 second range; 0-100-0 mph in less than 16 seconds, top speed of 175 mph and stopping power from 60-0 mph in 120 feet. And just like with the earlier-revealed Grand Cherokee SRT8, owners of any Chrysler Group SRT vehicle receive one day of professional driving instruction from the Richard Petty Racing School as part of the SRT Track Experience, designed to maximize their driving knowledge and skills on the street or track. Sessions are held throughout the year at selected tracks. 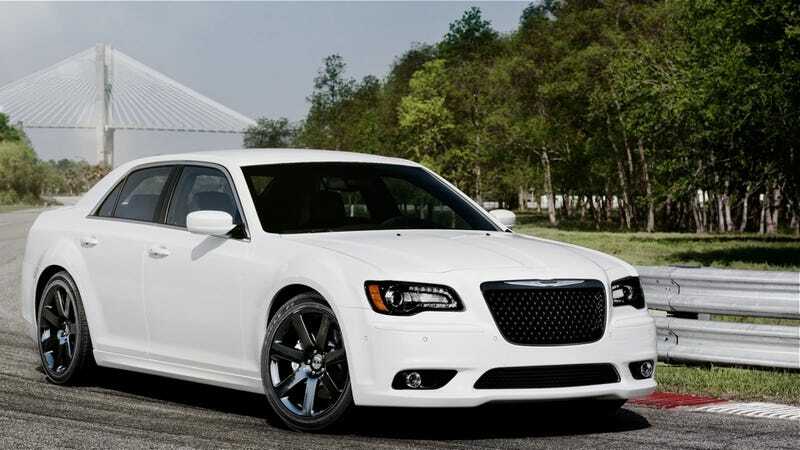 New for 2012 is an Adaptive Damping Suspension (ADS) system that is tuned specifically for the Chrysler 300 SRT8. The ADS system also uses a wide range of on-road and driver inputs - such as vehicle speed, steering angle, steering speed, brake torque, throttle position and lateral and vertical accelerations - to automatically tune the suspension for specific conditions when necessary. The 2012 Chrysler 300 SRT8 features 14.2 inch (front) and 13.8 inch (rear) vented/slotted rotors with four-piston Brembo calipers painted in silver finish. Improved brake cooling and fade performance comes courtesy of new underbody belly pan with integrated brake ducting. The SRT8-ified 300 can be found in Chrysler showrooms in the third quarter of this year.